A shallow cyclone, designated #92L has developed midway between the Azores and the Canary Islands this past weekend. It is currently located just west of Madeira island, gradually moving east. 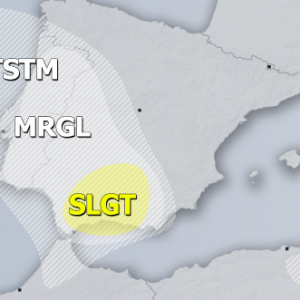 This cyclone does not have tropical characteristics, but consists of widespread thunderstorms which could potentially result in flash floods across Madeira and possibly parts of the Canary Islands in the next few days. Infrared satellite image and water vapour satellite animation indicate cyclone’s centre just west of Madeira island, with some deep convection on its eastern part. 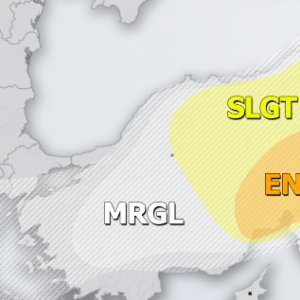 The position of the cyclone today and accumulated precipitation until Wednesday. The future path of this cyclone will likely lead it between Madeira and Canary islands before turning NE towards NW Morocco, Gibraltar and SW Spain. These areas are likely to receive some gusty winds when the cyclone nears on late Wednesday, as well as locally heavy rainfall and some flooding threat potential. However, the cyclone #92L will not be strongly organized, so widespread dangerous weather is unlikely.